Note: The black dot fade pattern is included on the wide blue stripes just like original GM! 1994 Pontiac Firebird Trans Am Fourth 4th Generation by General Motors commemorated Trans Am's 25th Anniversary and was the Official Pace Car at DAYTONA 500, February 20, 1994. It also paced AC DELCO 500 Race at NC Motor Speedway, October 23, 1994. In Pace Car regalia, this Firebird burned up the track and its door decals declared it worthy. 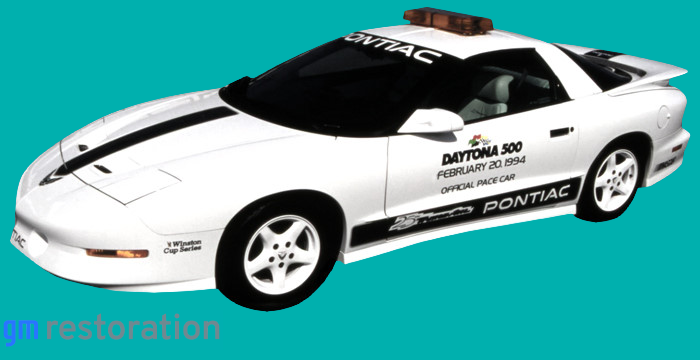 Get a limited set of these Pace Car Decal & Stripe Kits before they are gone.